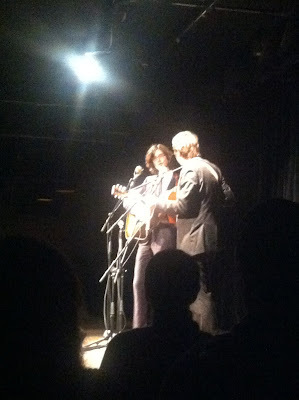 On Monday, April 29th, I had the opportunity to see The Milk Carton Kids play at the Ark. I was hesitant at first because I had never heard of them before, but let me tell you, I was SO glad I went. For those of you who haven’t heard of them, The Milk Carton Kids are Kenneth Pattengale & Joey Ryan, a duo whose musical sensibility and even physical appearance is reminiscent of a bygone era. The pair came onstage looking very dapper in matching black suits and proceeded to croon their hushed, harmony-filled tunes with grace and ease. The simple, poetic lyrics evoked Simon & Garfunkel, while the fingerpicked guitar and folk-bluegrass style recalled Gillian Welch or the Punch Brothers. As if their music wasn’t enough, Kenneth and Joey also provided hilariously sarcastic commentary between songs, such as the intro to “Charlie,” a heart-wrenching song written by Kenneth to his baby daughter Charlie, who “doesn’t yet have a due date…or a mother.” They played some songs from their most recent album (released in March), The Ash and Clay, in addition to some oldies from their 2011 release. Their performance of "Michigan" was especially touching with its hauntingly beautiful lyrics. Another favorite was "Memoirs of An Owned Dog," in which Kenneth sings from the point of view of a (dead) dog in a Dylan-esque voice. They seemed very comfortable with the venue and expressed a great interest in returning a few times a year. The discerning folk fans in Ann Arbor would do well to be on the lookout. Aoife O'Donovan, a country belle from Boston, was the opener, and she played a fantastic set in addition to providing sweet vocals for a couple of The Milk Carton Kids’ songs. All of their albums are available to download for free on their website. You should definitely give The Milk Carton Kids a listen - they are really something else!